Next Post > Next post: Five Gold Rings – A Christmas Carol Competition! Nice 😀 But I still haven’t found a local shop selling the PC version in Finland, I sure wonder why? I need to check Gamestop on Wendesday. And I’m not surprised of how well M&S is selling! Sonic was top on my want list. Obviously. I don’t hate the other ‘big’ releases, but they’re way too overhyped. Not fair. COD=Pathetic rehash EVERY time. The others, not so much. But COD… Ugh. I want a HD remake of Sonic Adventure SO MUCH!!! 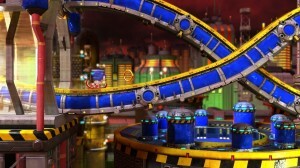 What I’d REALLY love is a hack that makes Super Sonic lose 1 Ring every second with infinite boost, a la Sonic Colors. Technically, I wasn’t the first to use a hack like that. I was just the first to make a video of it in action. And still, it was just a model swap, not the actual Super Sonic skill being used. P.S. – Speaking of Sonic Stadium, it’s been ages since I’ve done anything here. People raging on CoD: MW3. Makes me rage myself. I wonder if the game is doing any better here in the US… I mean, the Thanksgiving Day Parade had to give the game some publicity. Wonderful. I love this kind of ieas. It was great. Wish to read more of such.